Stand by for a new RBackup v11.16.20! We are looking forward to an April 3 release for our latest version of RBackup, v11.16.20. This release will represent a significant upgrade to many core components, increasing RBackup’s speed and capacity, while making significant improvements to reliability. RBS Server performance update – RBS Server can now handle peak load with almost no degradation in system performance or endpoint transfer rate. Major updates have been made to the backup module to make it more reliable and fool proof than ever before. Major performance updates have been made to the endpoint SQL backend to handle large backup jobs more efficiently. A new more advanced Purge/Sync module has been implemented to better handle extremely large backups, reducing the time required for most backup jobs time to half that used by previous versions. A new Restore module is much faster and robust than ever before and can now effectively handle network time outs. The Full Image Backup module is now twice as fast as before, and can back up and restore huge volumes. There’s much more to this release. We will notify you again on release date, and we will post a full change log with all the updates at that time. The latest RBackup v11.16.20 to be released on April 3 2017 is being tested in-house by Mitch Romm (Dr. Backup). Mitch sent in this report, which shows significant improvements in the latest version. We service about 2,500 endpoints. Each endpoint is bandwidth restricted to 2Mbps. About 15% of our base is now 11.16.x. As shown on the weekly graph #2, traffic during weekdays is pretty much constant. 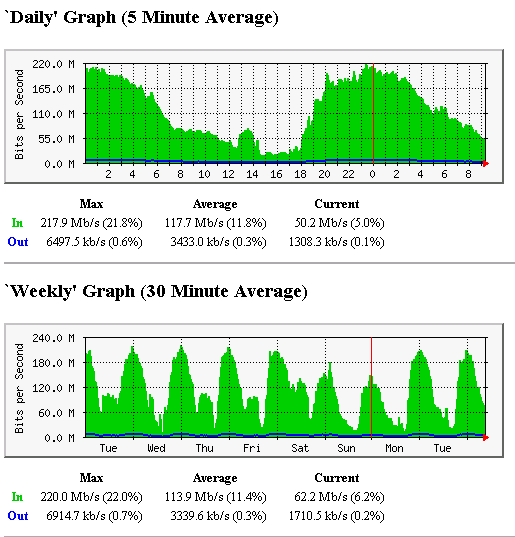 On weekends, we typically run full image backup, so customer volume over the Internet is lower. Some of the bumps in the graph you see during business hours are us doing “bulk” baseline to disk uploads of customer data. Of particular note is that the enhancements to the RBS server in recent releases has definitely smoothed out the traffic and made operations much smoother. Prior to fixes to the file “append” code, our performance graphs tended to be much more jagged (like a heart “EKG”) and service times much less predictable. This type of network graph indicates real progress in your team’s engineering efforts. The ability to do automatic endpoint upgrades is one of RBackup’s most helpful features. Here are three KB articles that explain how to take full advantage of this powerful feature. Will the Portal’s Endpoint Auto Upgrade feature upgrade my existing Endpoints? Full Image Backups – If you aren’t using them, start now! One of the most important features of more recent RBackup releases is the ability to perform full image backups – not just of files, but of the entire drive image. Full Image Backups give you the ability to protect the entire hard drive – bootable operating system and all, in its current state, including all data on the drive. RBackup’s Full Image Backup function backs up to standard Hyper-V files that can be mounted within seconds by any Hypervisor. This allows you to spin up an entire server in a virtual environment in just minutes after the physical server crashes. It’s pretty much the ultimate in convenient, fast disaster recovery! Mitch Romm at Dr. Backup has written tutorials that show exactly how to use Full Image Backup.